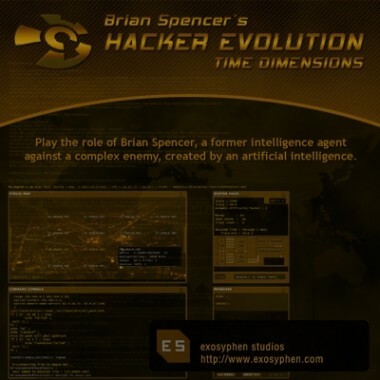 Hacker Evolution is the game that spawned a series of three hacking sims by Romanian indie developers exosyphen studios. Since then, exosyphen has provided a steady stream of updates to the title. Brian Spencer is our hacking hero. He is a master hacker and a former intelligence agent. After a failed mission resulted in the death of his family, he retired to his own island in the Pacific Ocean and became a security consultant. The story starts in December 22, 2015 after a chain of mysterious hacks cripple the New York Stock Exchange, the Xenti Corporation, and several other companies. Spencer is hired to find the culprit by John Davis of the Federal Securities Agency. 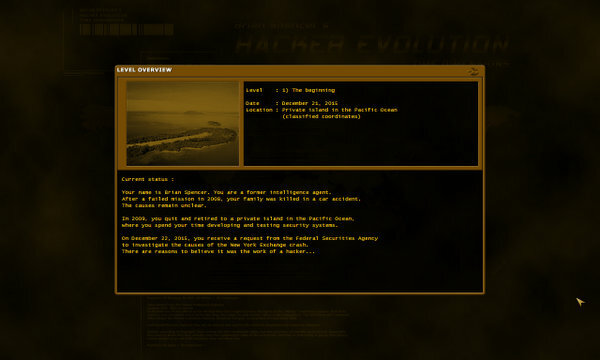 Hacker Evolution’s plot is told by short emails received during gameplay and several paragraphs in between levels. Since the base game is only nine levels long, the plot has about the same amount of content as a TV episode. However, without spoiling too much, it is pretty standard sci-fi fare with a nice light splash of intrigue thrown in for good measure. Hacker Evolution is actually a strategic puzzle game more than an actual hacking sim. Playing the game probably won’t teach the player much about real hacking, but the game is mostly controlled by inputting commands into the console. Like an actual console, many commands can be completed with a quick tap of the tab key, allowing slower typists to having a fighting chance. Aggressive actions against other servers like stealing money or attempting to crack their passwords will trigger a trace. If the trace is successful, the player automatically is hit with a 50% penalty to their total trace amount. If the player completes the action, they will gain a smaller penalty to their trace amount. If the trace reaches 100%, it is game over. 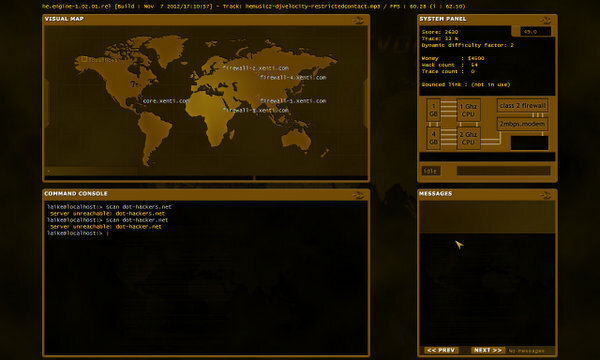 The trace amount can be lowered by spending $500 in a killtrace command. However, there is an extremely limited amount of money available in the game. Players can slow down traces by hiding behind other hacked servers, but each server can only be used for three aggressive actions before becoming useless. Players will need to strategically plan their actions and carefully balance their spending between better equipment and killtraces to hide their tracks. The puzzling elements come in the hints that are scattered across the game. Players will need to have a keen eye to spot server addresses and solve clues to figure out passwords. exosyphen studios does a masterful job of subtly slipping in these clues while maintaining the feel of being a hacker poking around in someone else’s files. There are several side servers or alternate methods of handling certain servers for the observant. I found the game to be fiendishly difficult by default. Making a newbie error like buying an unneeded upgrade early in the game can cause the game to become practically impossible to complete in later levels, requiring the player to start the whole game from the beginning. I would have liked to see a level select option that would allow players to pick up from previously played levels with some basic upgrades and a small amount of money. I am not ashamed to admit, I found myself enjoying the difficulty of the game more after giving myself an extra 10,000 dollars in the early levels while I figured out the mechanics of the game and alleviate some of the do or die pressure of the game’s default difficulty. Hacker Evolution comes with a full set of mod tools that allows players to create their own missions. 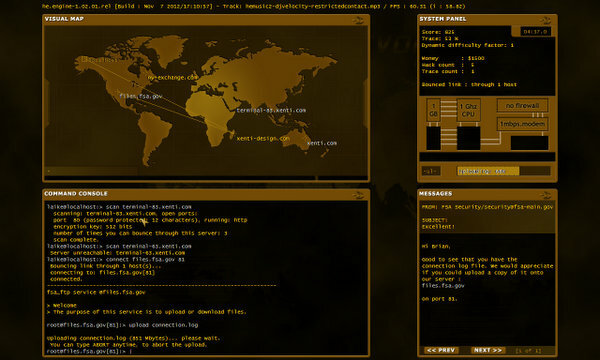 exosyphen studios released an expansion campaign for Hacker Evolution through these mod tools. Many user mods can be downloaded at the exosyphen webpage. Buyers who purchased their game from Steam or Desura, instead of purchasing the game through the official site, will unfortunately need to go through the hassle of sending in a screenshot of their purchase so they can get access to the database of mods. Hacker Evolution comes with a variety of skins to provide a little visual variety. At its core, players will stare at the same screen for the whole duration of the game. The UI is well organized. The mono colour palette has a retro meets high tech feel to it. Hacker Evolution does not have a windowed mode at this point. When the game was developed, 1080 monitors were a rarity. The game is currently maxes out at 1440×950 resolution, but exosyphen has confirmed on the Steam forums that they are working to update the game to support modern resolutions and windowed modes. Hacker Evolution comes with a nine track electronica soundtrack by DJ Velocity. The soundtrack plays on loop similar to an MP3 player, allowing players to skip tracks they may not like. Unfortunately, this means the game doesn’t adjust the music to the pace of the game. Instead, the music keeps an intense feel to it at all times which can be a little tiring after long sessions. The sound effects contain a library full of computerized beeps and blips that fit well with the high tech meets retro theme of the game. Certain error messages are announced out loud by a female voice. The strong audio experience for Hacker Evolution is fits the game’s theme perfectly. Hacker Evolution is an excellent puzzle game hobbled by its difficulty level. The learning curve is rather steep. However, Hacker Evolution has some great puzzles worked into the hacking theme. The visuals and audio help build a great high tech meets retro feel to the game that fits the game perfectly. For those willing to look past Hacker Evolution’s age and difficulty will be rewarded with a solid puzzle game.